Aalayam - Colors, Cuisines and Cultures Inspired! : An Artist with a Heart...A Brand with a Soul! An Artist with a Heart...A Brand with a Soul! Courage, Grace, Friendship, Enigma. Words that describe today’s featured artist. But words that do not do complete justice to her earthy charm, and the noble cause she espouses. There is some attraction about this gorgeous lady, who lives a continent away, that draws me to her. It’s like we are long lost friends, bound by an inexplicable connection, although we have never met, or spoken. We seem to be kindred spirits, with similar aspirations and matching unflagging positivity. I feel it only apt that I am so taken with what she says, and how she says it. I am agog with excitement to view her curated collections. I always watch to see what she is wearing, because trust me, she is very well put together, she is a global desi and wears her pochampally, kanjeevaram, ikkat and kalamkari with aplomb! I am eager to see her brand babies, as and when she conceives them. I am keen to read her responses to my questions, and I am ecstatic to share her with you, my dear Aalayam family! 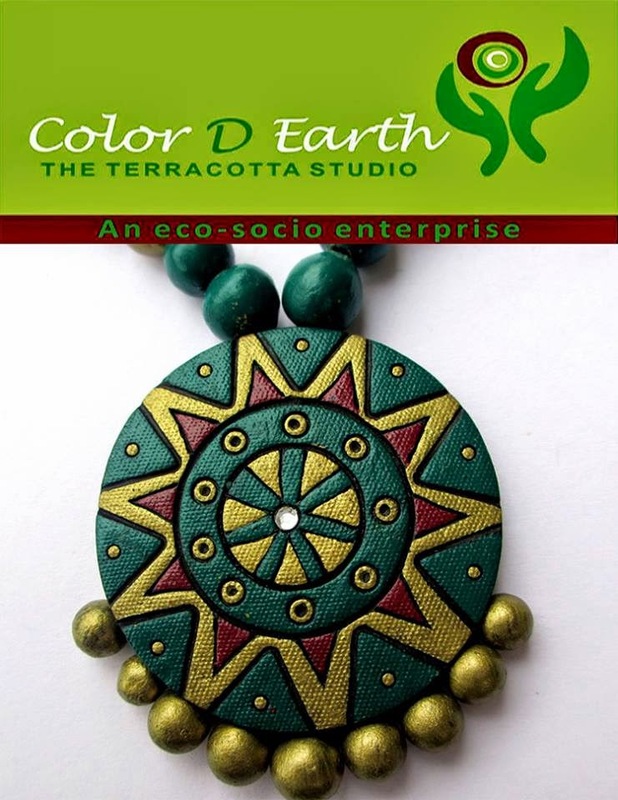 Presenting to you Hema Subramanyam, and her eco-socio brand of terracotta accessories – Color D Earth. 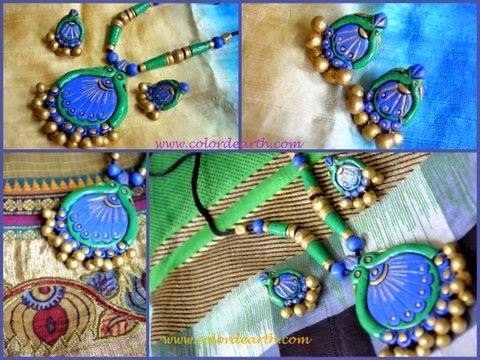 Hema designs terracotta (clay) accessories – earrings, necklaces and matching sets, replete with sublime color & intricate aesthetic . 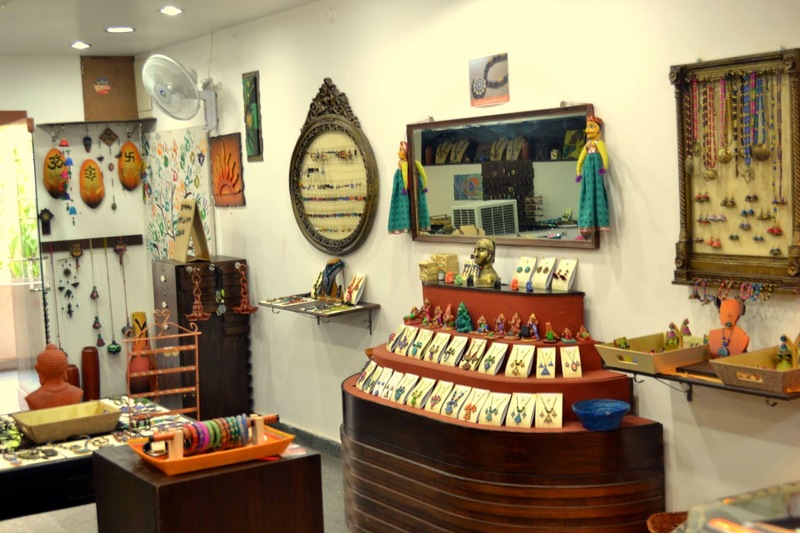 She also designs terracotta Ganeshas, chotchkies and home accessories. She has a warm, welcoming and rustic looking studio full of color and life in Banjara Hills, Hyderabad, India. Apart from this brick and mortar establishment, Hema curates her accessories via her website www.colordearth.com. 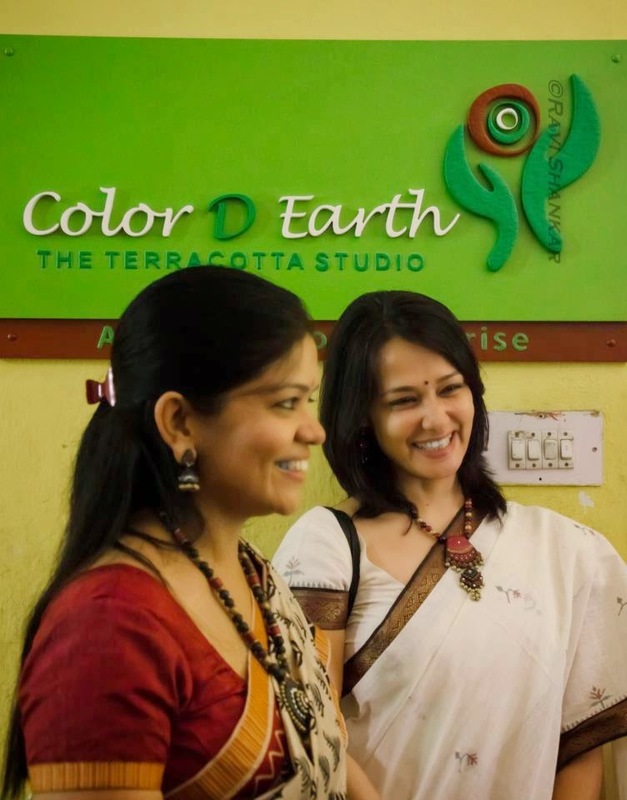 I for one, know that I will visit Hema’s Color D Earth studio, and come back with tons of goodies for me and my friends (desi and videsi), whenever I am in that part of the world. Take a peek inside her studio, you will fall in love. Terracotta has always held allure to me. I used to buy it in Desi Angadi in Bangalore, and exhibitions at Chitra Kala Parishat. I would love to wear them with Khadi Kurtas or Kalamkari Sarees. I still own a few pieces of this earthy gem. And I bring it out now and then whenever my nostalgia for home is paramount. What attracted me to Hema’s brand Color D Earth ,is that it’s one of a kind. Not a cliché, it’s true. The designs that we see, are like those never seen before in the realm of terracotta. Jewelry brands a dime a dozen these days, and it take a keen eye of a jewelry connoisseur to get drawn to a brand, and to stay enamored by it. And the positioning that Hema has done to her necklace & earring sets to complement any ensemble, be it a luxurious Kanjeevaram, or a cool cotton saree, is just what is the order of the day. I have even seen her offer terracotta pairings with ensembles with a heavy western influence as well. Now that's true cultural translation, being able to work in the fabric of any style….any influence….any continent. Hema's personal treasure trove...and look how lovingly her sarees wait to be picked. Now I am hooked, I want to know more about Hema, and what she does. I follow her on Facebook, and see that she is involved in many social causes, she runs Color D Earth as an eco-socio enterprise , she employs many deserving artisans and keeps their families fed and schooled. She also mingles in the entrepreneurial and academic circles hosting workshops and conferences, talking about her one-woman entrepreneurial journey, educating, inspiring and mentoring many who aspire to be like her. 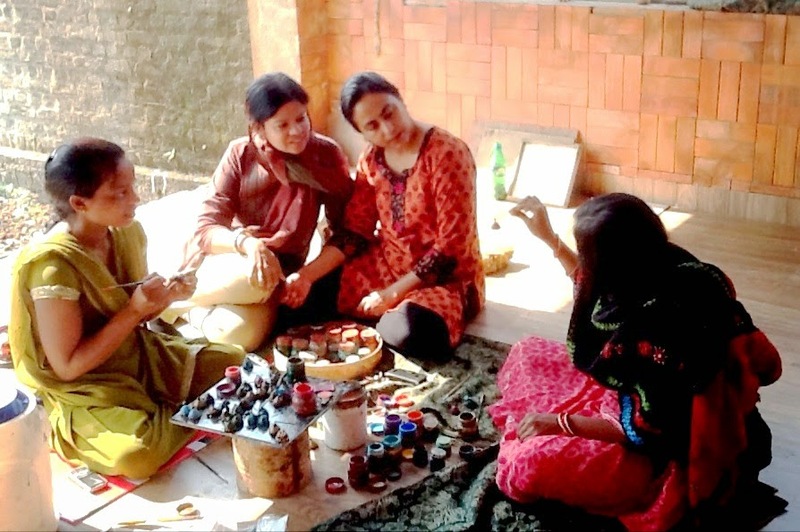 Her business model is globally appealing, because it is ecologically sustainable, it supports minority artisans, it supports diversity and the best part is (bonus! ), her brand is GORGEOUS! Hema is also a super-mom, juggling everyday commute, school lunches, homework and teenage angst, amidst rubbing shoulders with celebrities and the terracotta’s unsung heros. In the midst of this all, she is always smiling, always exuding positivity & enthusiasm. Always inspiring!! That’s what it takes to be a An Artist with a Heart...A Brand with a Soul! Ladies and Gentlemen – Hema Subramanyam. 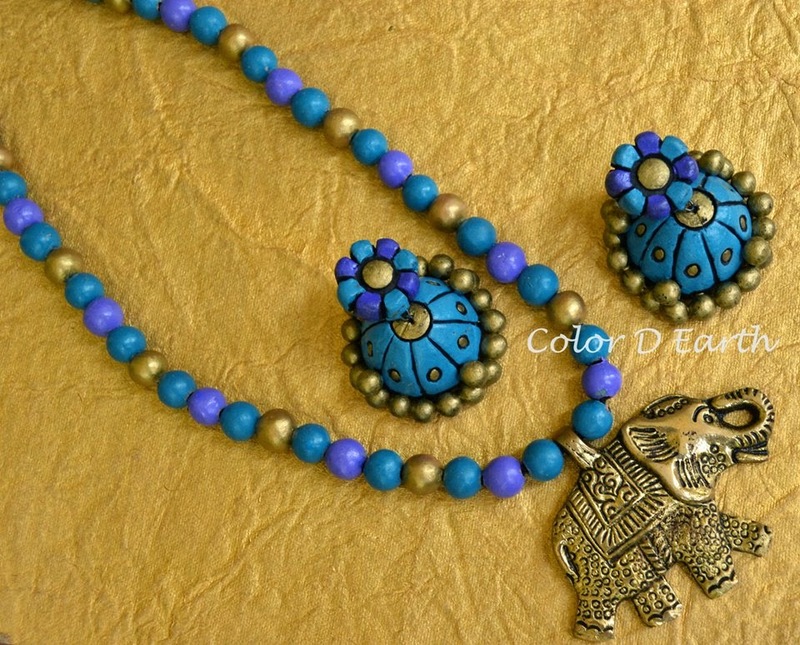 Supriya (S): Hema, I personally love Terracotta jewelry. They are so versatile. 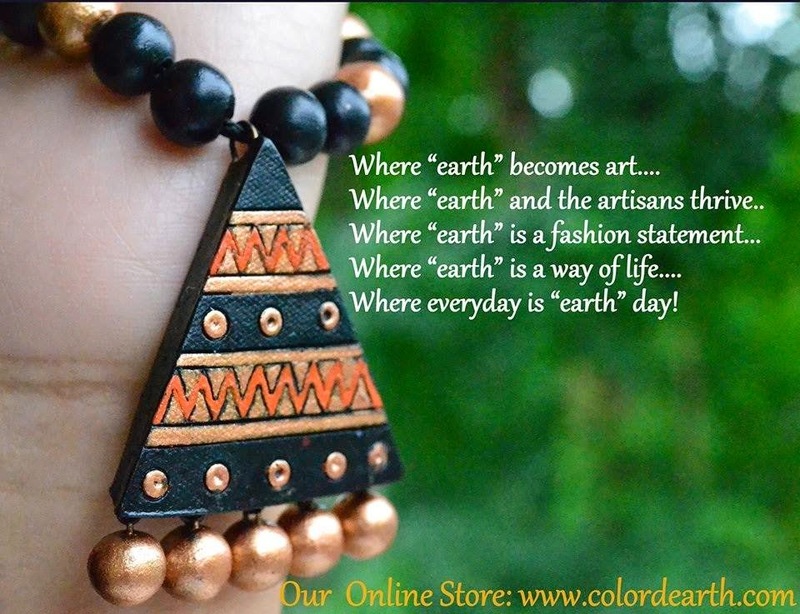 And you seem to have captured the quintessence of Terracotta perfectly in your brand “Color D Earth”. We want to pick your brain to know more about it! First of all, what got you started?? And why Terracotta? S: Where do you derive your daily inspiration from? What gets you started designing an ornament? When you work with a medium as profound as the earth, when you believe that the creativity born of Bhumi Devi is infinite, then art begins to take on a different meaning. Terracotta jewelry was the first kind of jewelry humankind adorned. Terracotta is the bringing together of the 5 elements of nature, the Panchabhoota – earth, water, wind, fire and ether! I am not a designer by profession, but have always had an eye for aesthetics and detail! I am inspired by geometry, symmetry, balance and intricacy! I started out wanting to be an HR professional and was a trained vocalist in Carnatic music. Somehow the artist and the professional came together in a way I had never imagined! There was an innate desire to do something meaningful, something that would make a difference! When I started making terracotta jewelry in 2003, we started with the name Alankriti Terracotta Jewelry. I trained 3 women in the craft and worked from home and we handcrafted our own designs. Our color combinations and the finish was what made us stand out! When you give yourself completely to what you love, then it’s also the start of the journey inward! I am also blessed to have found my inner calling - to champion the cause of terracotta artisans who were not getting the true value of their labour of love! Today I work with 11 artisan groups from across 6 different states who put their fascinating talent and creativity into creating the most exquisite jewelry from riverbed clay! S: Color D Earth is an eco-socio enterprise. What do you aspire to achieve with that branding, and what have been the highlights of your career as an eco-socio entrepreneur? H: Initially, we supplied our work to some reputed boutiques in Bangalore, Hyderabad and Chennai. Our work was appreciated but we worked on the consignment model which according to me was not working. At the same time I started working with a few other artisan groups who were also struggling. I decided that I had to find a way to make this work! Except I hadn’t the foggiest idea of how to run an enterprise successfully! Barely anyone from my Tambram Iyer family had forayed into business, much less using clay ! Hema smiles brightly as she rolls up her sleeves and brings her designs to life! It took me 6 years of persevering through some really tough times, making sure I was giving the artisans continuous orders, while still sometimes not breaking even! I was praying for a miracle when I applied and got selected to do the 10000 Women program for Women entrepreneurs! That was a turning point because I was able to learn the key aspects of business that I had been missing out on! 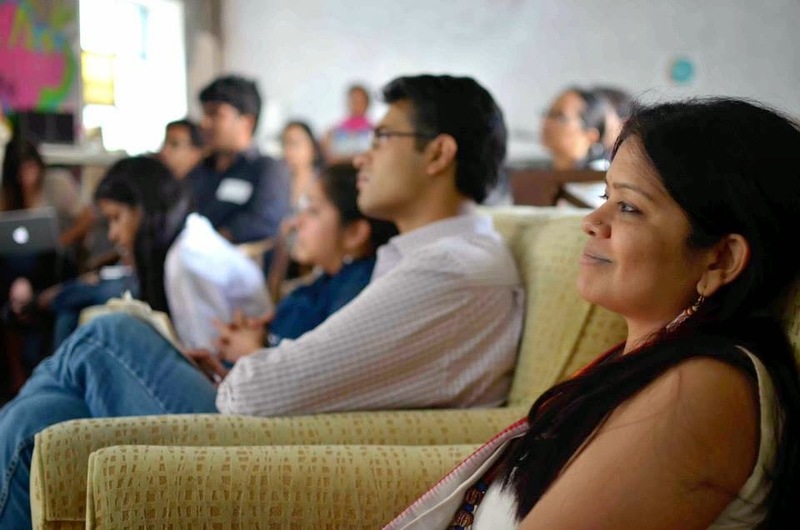 Right after the course, I researched, how handcrafted businesses had grown and discovered that the Social Enterprise model was a for profit model while working for a social cause. This was exactly what I had been doing all along! Color D Earth was born early in 2010. 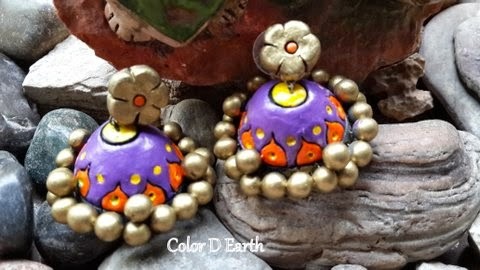 Today we showcase the widest variety of terracotta jewelry from 11 artisan groups across the country at our Studio and our online store – www.colordearth.com. Our forte lies in forging meaningful associations with our wonderful customers from across the globe! 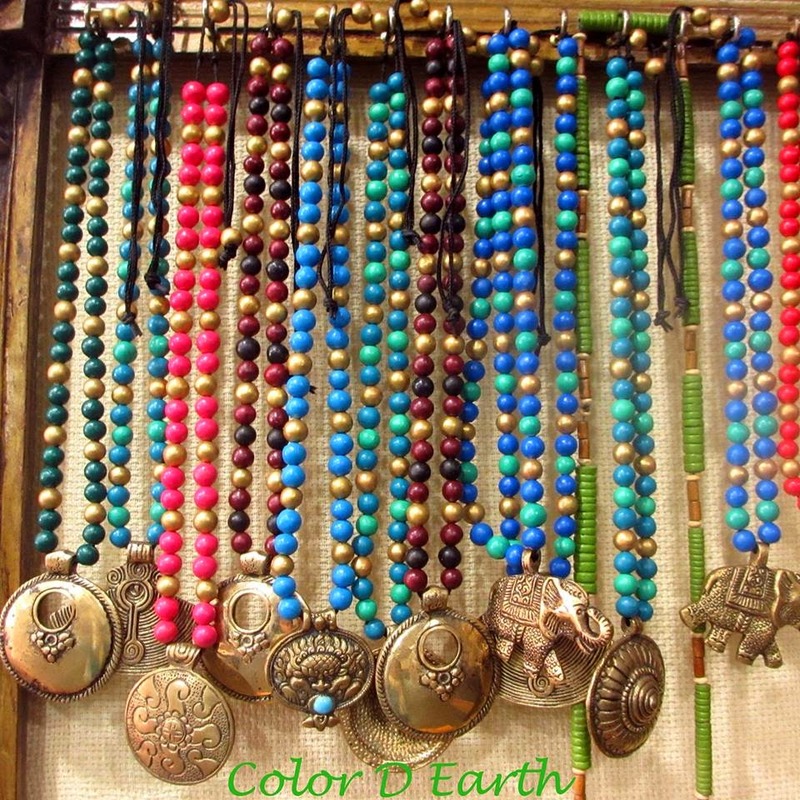 Color D Earth is not just a jewelry store but a brand that represents a cause, that stands for the expression of a woman’s individual sense of style! I was nominated by the US Department of State for the International Visitors Leadership program on Women and Entrepreneurship in March 2012. I travelled across the United States with 11 women entrepreneurs from South and Central Asia for 3 weeks on this prestigious and amazing learning experience! Last year I was selected as an investee with UnLtd Hyderabad, an organization that finds, funds and supports social entrepreneurs. This has been more often a very challenging yet fruitful learning journey that gets better every single day! S: Hema, please talk to us about your collaborations. With Fashion Houses, schools and other brands. H: One of the exciting highlights of our journey this year was being featured in the Fox Traveller channel with the renowned designer duo Shantanu and Nikhil! They brought together the exquisite geometric weaves of Pochampally fabric with terracotta jewelry in a contemporary outfit created for the actress, Yami Gautam. Check out the Ganesha viewing a laptop, and the Ganesha doing belly crunches! H: Terracotta has traditionally been a seasonal occupation. The evolution of terracotta jewelry as an art form has ensured that it’s a sustainable means of livelihood! Working with our artisan groups on fair trade principles has given them the confidence to hold on to their cultural roots. Each artisan group’s creativity represents their unique heritage and culture. S: Has your creative entrepreneurship changed your everyday perspective - at home, at work and at play? H: Color D Earth is born out of the culmination of my creativity, inner calling and value systems. I believe in sustainability, preservation and green living. I am in my element when I wear a handwoven cotton outfit/sari accessorised with an exotic piece of earth! I don’t wear any other forms of jewelry anymore! When it comes to eating, I love my food to be a healthy mix of green and brown. I look for an earthy alternative to everything – jaggery, brown rice, red rice poha, brown rice dosa , multi grain rotis. Thankfully for me, my kids love it too! I make sure we have a creative, eclectic yet nourishing menu planned every week! S: How do you give a modern slant to traditional designs? We see your jewelry being worn with the classic Kanjeevaram and also paired with Guccis. So tell us more! 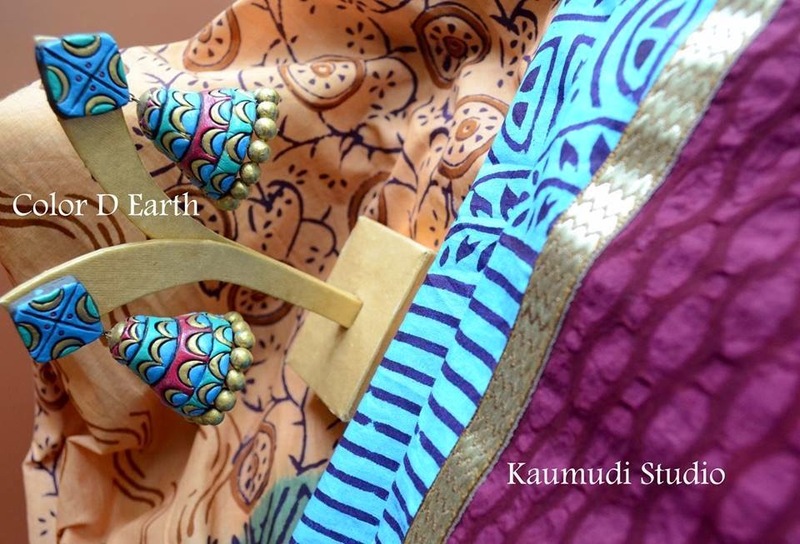 H: The sheer versatility of the medium of clay gives it the power to be handcrafted by hand into an accessory for ethnic Indian or a contemporary outfit! There was a time when women could not think beyond gold and diamonds to wear to a wedding, but today there is a huge change in their mindsets! Women are looking for that eclectic yet earthy medium to express their unique fashion sense! Women are more socially and ethically fashion conscious than ever before! Therefore their attire and accessories naturally express their attitude! This evolution has been amazing to witness and we imbibe our inspiration from these beautiful women who are not afraid to express themselves! Today we cater to the woman who likes to wear an ornate piece of earth to a wedding with her finest silks to the woman who likes to wear our trendy terracotta range to work, college, or just anywhere! S:. Finally, what does a Day In The Life Of Hema Subramanyam look like? H: I am an early riser. I begin the day with listening to vedic chants while working in the kitchen and getting my teenagers to school and checking on mails and Facebook! A 20 minute oxygen boost with a brisk walk either on the treadmill or outdoors is key to a high energy level all day! I do have the luxury of getting to work at 11, but that is usually after few errands on the way! I get back home early if the kids have exams, but usually at 7:30 and eat an early dinner made by my godsend cook Janaki. For 2 ½ years when we had a kiosk in a mall, I worked 365 days of the year without a day off! Now that we work out of a Studio, we are closed on Sundays! They are the day I recharge by doing the things I love, sometimes doing nothing can be the best thing! I have some wonderful friends who make my life so much more meaningful! I meet amazing women who are my customers, many turn into good friends! I am part of a few meaningful groups - community service groups and women entrepreneur groups, and attend meetings during the week! I am blessed to have an interesting life! Being a woman entrepreneur means you have to deal with work while at home and deal with home matters at work! I honestly find it difficult to separate the two and quite enjoy the madness of it all! Hema, you truly are a kindred spirit. I feel we will be very good friends when we meet. It will be a conversation that will not stop. Thank you from the bottom of my heart for agreeing to be featured on Aalayam. I am honored to be featuring you and your brand. 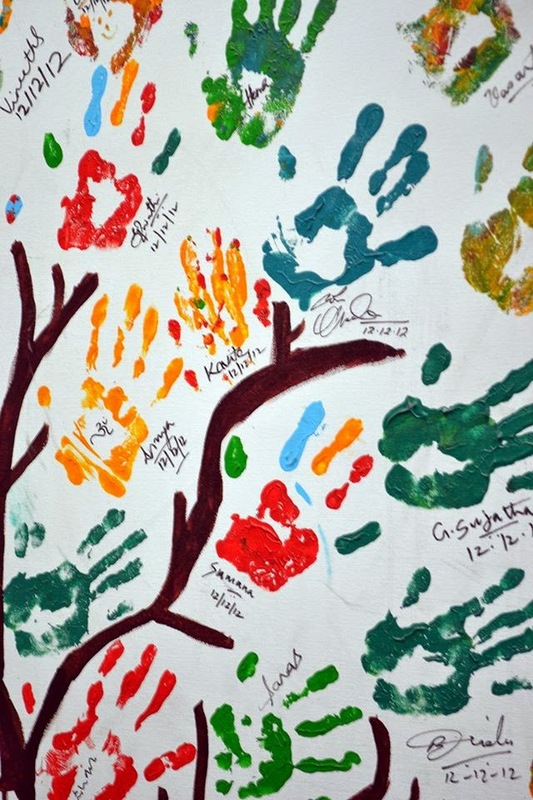 Aalayam wishes you and Color D Earth only the best in the years to come. But had no idea on other facets to her. Really impressive! I could not agree more Esther. I wish I can meet Hema soon! I am looking forward to wearing a few of my coveted pieces from her studio. Until then, I will live vicariously looking at you and the other beauties who adorn Color D Earth! Thanks for commenting, do join the growing Aalayam family. We love welcoming new members, and would love to have likeminded souls like you! Just love the way you weave a story. Very inspirational!!! Aarthi! Flattered my friend. :) Thank you for stopping by, and commenting. I truly appreciate it! Just catching up with soulful Aalayam :) This is a beautiful, genuine interview.. Admire how down-to-earth hema is while being a global representative of india in the socio-economic-craft space. I havent work terracota jewellery before but this read sure changes my mind! Thank you Ambika. Hema blew me away with her simplicity and her down to "earth" demeanor. She is a true inspiration. Thanks for stopping by and commenting! Do join us as part of the Aalayam family. We are a growing niche of culturally like minded people, getting together over the internet! Would love to see the family grow!